Jammy Furniture Mod adds furniture into the game. 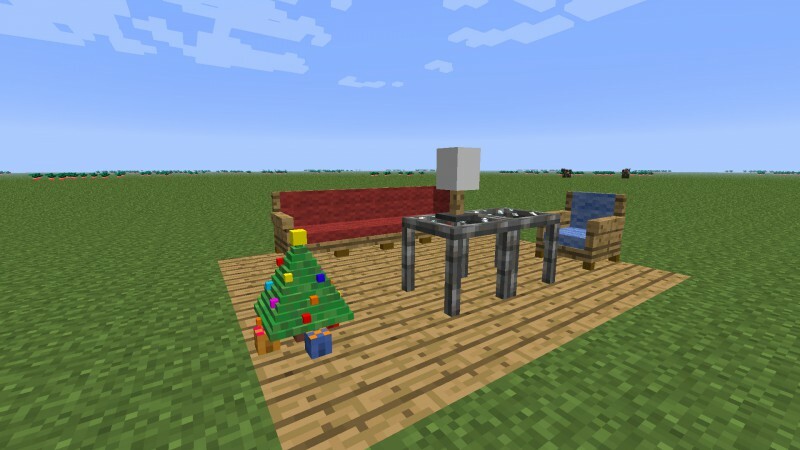 This mod adds Chairs, Couches, Fridge and Freezer, Blinds, Lamps and more! Take a rest and sit on a chair. Cool down by creating ice from water in the freezer. It’s night time so shut the curtains. You can sit on chairs or couches by right clicking on them. The freezer can freeze water and lava, water makes ice, lava makes obsidian. You can open and close curtains or blinds (it will actually make the room darker!) You can place stuff on top of tables. You can create carpets and get more uses out of wool. Lamps you can right click and turn them off and on for light.